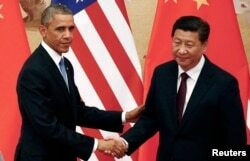 China and the United States have jointly announced what they are calling a major agreement on climate change. The agreement was reached following talks in Beijing between President Barack Obama and his Chinese counterpart Xi Jinping. The announcement could help play a key role in global efforts to combat climate change. The U.S. and China are the world's top emitters of carbon dioxide. The two leaders also pledged to work together in a wide range of areas, but differences between the two countries still loom large. U.S. President Barack Obama (L) shakes hands with China's President Xi Jinping during a joint news conference at the Great Hall of the People in Beijing, Nov. 12, 2014. ​During a joint news conference following high-level talks in Beijing, Washington announced plans to cut greenhouse gas emissions by up to 28 percent by 2025. That goal, if reached, would bring U.S. emissions to levels below those in 2005. China did not commit to cut emissions, but for the first time Beijing set a goal for its emissions to peak by 2030. Obama said it is an ambitious but achievable goal for the world’s two biggest emitters of greenhouse gases. “I commend President Xi his team and the Chinese government for the commitment they are making to slow, peak and then reverse the course of China’s carbon emissions," President Obama said. China and the United States hope the announcement will help to overcome longstanding differences in the global climate change negotiations and be a “shot of momentum” ahead of next year’s United Nations Climate Change Conference in Paris. President Xi said China is willing to work together with other countries to address global challenges. “As China continues to develop we will shoulder more and more international responsibilities that match our strengths and position," he said. The agreement on climate change was just one of several announced. The Chinese president said the two countries also will leverage their strengths to fight Ebola. Although some have criticized the speed of China’s initial aid response in the fight against the deadly disease, Xi noted that China now has more than 300 medical workers in West Africa and has donated more than $100 million to the effort. They also agreed to work together to fight other infectious diseases and to promote access to electricity across Africa. President Obama says they also talked about enhancing cooperation in Afghanistan and in dealing with terrorist threats such as the Islamic State. President Xi highlighted an agreement the two had reached between their militaries for confidence building measures that include notification of major military activities and rules of behavior for safety of military aircraft and encounters at sea. Before President Obama’s three-day visit to China, it was not expected that the trip would deliver such a wide range of agreements. But the major differences between the two nations remain, from concerns about China’s human rights policies, its policies in ethnic-minority areas and tightening controls on foreign journalists. President Obama said that during his talks with China’s leader he highlighted why Washington feels the freedoms it advocates are universal regardless of whether it is in New York, Paris or Hong Kong. “We think that history shows that nations that uphold these rights, including for ethnic and religious minorities are ultimately more prosperous, more successful and more able to achieve the dreams of their people," Obama said. President Xi did not directly respond when asked to comment on allegations that ongoing protests in Hong Kong are supported by western forces. Hong Kong’s leader has publicly made the allegation, as has Chinese state media on numerous occasions. The United States denies any involvement in the protests. It is unclear whether Xi’s comments were a sign that it was now ok for authorities in Hong Kong to clear the streets. Analysts have widely predicted that once the APEC meetings and high-level talks were over in Beijing, Hong Kong authorities were likely to launch a full-scale crackdown in a bid to end the protests. And although China and the United States announced the easing of visa restrictions for tourists and business people, President Xi was asked by one reporter to respond to concerns about growing restrictions on foreign journalists. China has rejected or denied visa applications for journalists from the New York Times, Bloomberg and for a reporter from Reuters, in what is widely seen as a campaign to punish individual reporters or their organizations for the stories they publish. A recent survey of more than 240 foreign correspondents conducted by the Foreign Correspondents Club of China found that 80 percent of those surveyed felt the situation in China for journalists is worsening. Xi, however, suggested that problem was foreign journalists. “China protects our citizens' freedom of expression and the normal rights and interests of media organizations, in accordance with the law," he said. Xi argued that when a certain problem is raised there has to be a reason, adding that media outlets need to obey China’s laws and regulations.